Wilson Lourenco has recently published an updated review of the geographic distribution and the biogeography of the genus Opisthacanthus Peters, 1861 (Hormuridae). This interesting genus is found both in parts of Africa, Madagascar and in South America. A new species from Madagascar is also described. 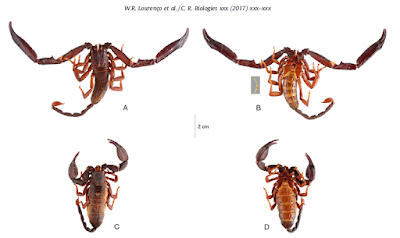 In this article I discovered an valid Opisthacanthus species that was not listed in The Scorpion Files. This species was previously synonymized, but restored in 1995 by Lourenco. This was not mentioned in the sources that I used to build The Scorpion Files. The species is now listed as valid. New comments are proposed on the geographic distribution of genus Opisthacanthus, and the Gondwanian model is further supported. The diversity of the genus is extraordinary in Madagascar, with the same number of species as in continental Africa, but sub-Saharan Africa is home to six out of the nine groups currently recognized of Opisthacanthus. Given the affinities of the Opisthacanthus groups and their current distribution, a center of origin in Africa could be favored for these ancient scorpions. The proposed Gondwana model suggests that the Madagascar Opisthacanthus are closer to those of the New World, which is consistent with the affinities observed in morphological characters. A new species, Opisthacanthus titanus sp. n., is described from the Torotorofotsy Forest, located in Eastern Madagascar. The new species shows affinities with both Opisthacanthus madagascariensis Kraepelin, 1894 known from dry regions in the western portion of the island and Opisthacanthus lavasoa Lourenc¸o, Wilme´ & Waeber, 2016 only known from the extreme southeast of the island. The new species and O. madagascariensis have similar external morphologies but the morphometric values are markedly distinct. Moreover, O. madagascariensis is exclusively found in spiny forest thickets and open woodlands, whereas the new species was found in the humid forest of Torotorofotsy. The total number of species in Madagascar is now raised to twelve. Biogeographical scenarios are also proposed to infer the origin of the Opisthacanthus and better understand its distribution in the New World, in Africa and Madagascar. Lourenco WR. Nouvelles considérations sur la classification et la biogéographie des Opisthacanthus néotropicaux (Scorpiones, Ischnuridae). Biogeographica. 1995;71(2):75-82.